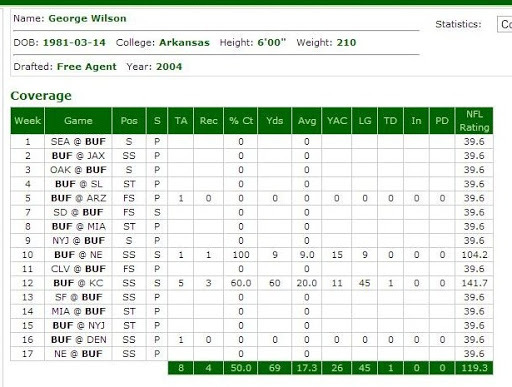 Pardon me for being late on this but here is my take on the Titans signing former Buffalo Bills safety George Wilson. First, for the ladies, he is smoking hot. Second, this is a good signing for the Titans and take the pressure off them (to a certain extent) to draft a safety high. For the record I do think the Titans will draft a safety and it wouldn’t surprise me if its not a safety that can play both free safety and strong safety like Wilson. How good is George Wilson though? Let’s take a look. 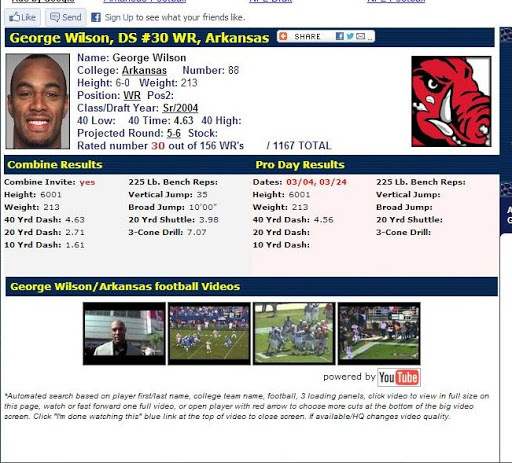 Wilson played college ball at Arkansas, where he was a walk on wide receiver. 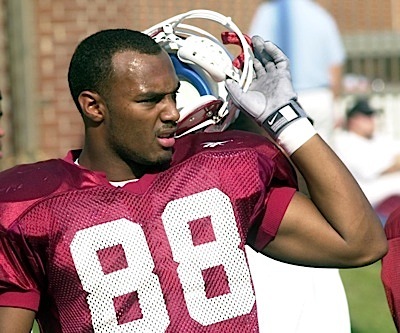 He ultimately became an All SEC wide receiver, racking up 16 touchdowns, 144 passes and 2151 yards. 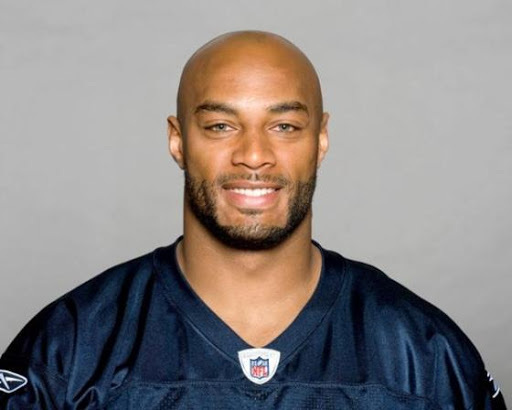 In 2004, He entered the NFL as an undrafted free agent wide receiver for the Detroit Lions. He didn’t make the 53 but was signed to the practice squad. When the Lions released him he signed with the Buffalo Bills. He was converted to safety by the Bills in 2007 and as the proverbial phrase goes the rest is history. He was a team captain his last 5 seasons in Buffalo. 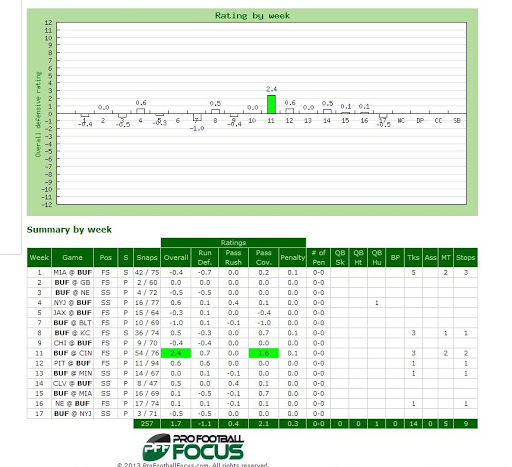 According to Football Outsiders Wilson can play both free safety and strong safety and the numbers for him over at ProFootball Focus back that up. 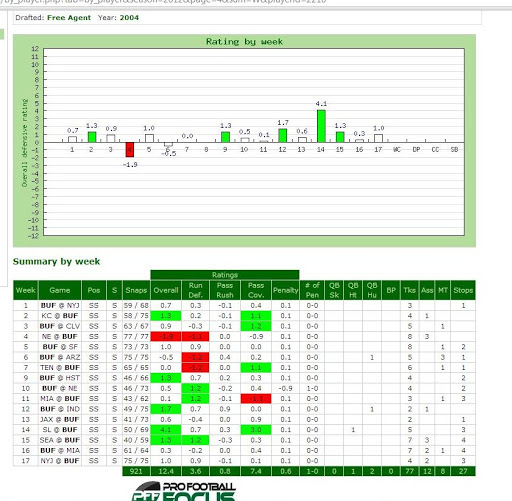 In fact, I think a very good argument can be made that he plays free safety just as well as he plays strong safety. 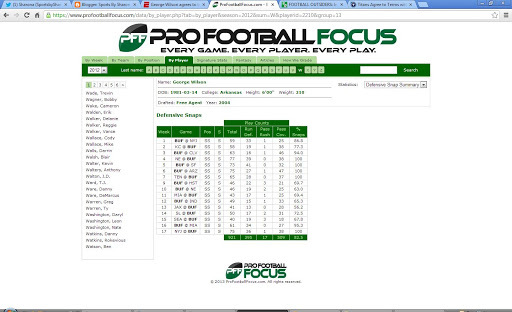 We will take a look at each year individually, going back to 2008, but he only played strong safety in 2012. He also has some special teams experience. 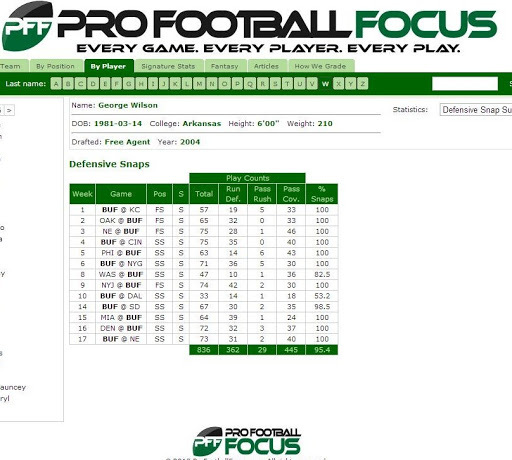 In 2008, Wilson played 9 games, 3 of which he started at free safety. 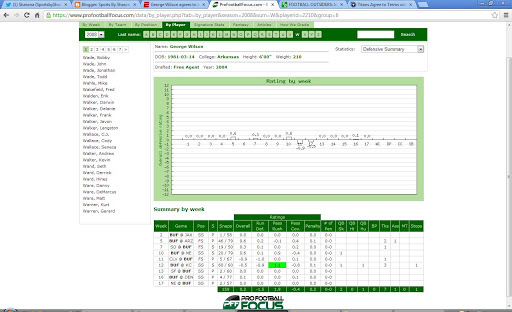 He played 159 snaps, had 2 sacks (neither at FS), 1 QB hurry, 7 tackles and 2 stop. 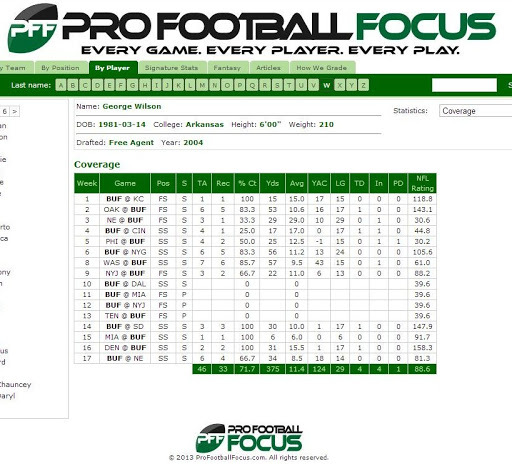 Yet it appears his best games in coverage that year were are free safety. He played 27.1 percent of the defensive snaps. 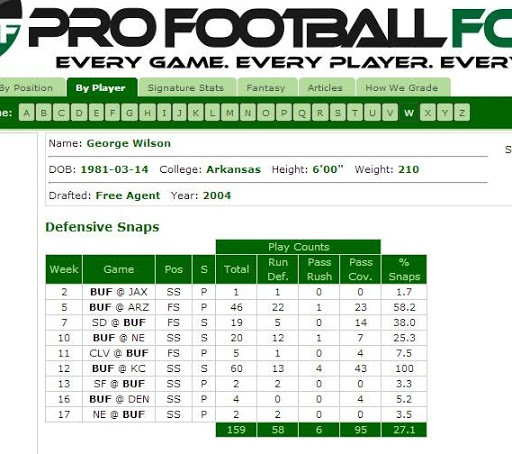 In 2009, he played entirely at strong safety and this was one of his best years. He played 90.3 percent of the defensive snaps, racked up 62 tackles, 1 forced fumble, 2 sacks, 2 QB hits and 1 QB hurry. 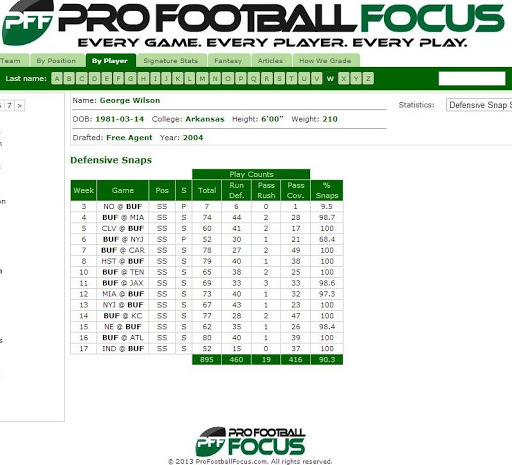 In 2010, he played 9 games at free safety and only played 24.3 percent of the defensive snaps. This seems rather odd in light of how well he played in 2009. 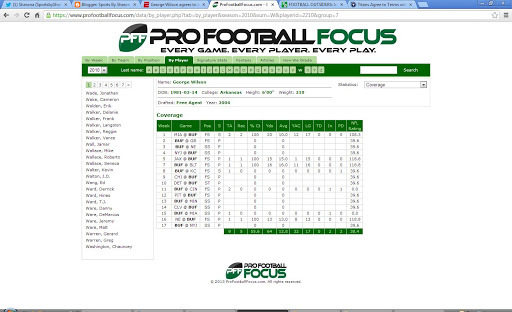 He registered 14 tackles, and 1 QB hurry. In 2011, he played 2 games at free safety and the rest at strong safety. He missed 3 games but still finished with 83 tackles, 1 QB hit, 2 batted passes, and 31 stops. 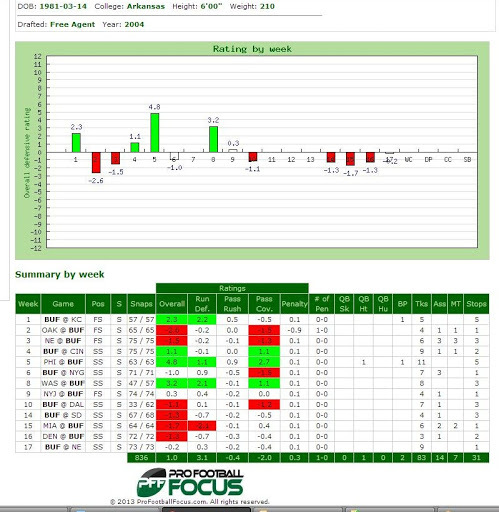 He also had 2 forced fumbles and played 95.4 percent of the defensive snaps. 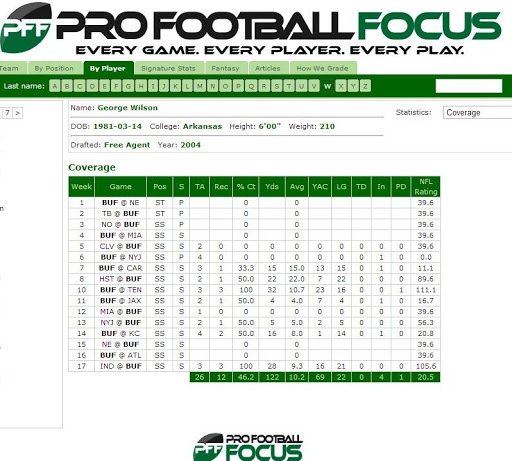 In 2012 as indicated earlier, he played entirely at strong safety and played all 16 games. He finished the year with 921 snaps, 77 tackles, 27 stops, 2 QB hurries, and 1 QB hit. So there you have it Titans fans. Welcome to the team George Wilson! P.S. He also has done some modeling and has a music video with Mary J. Blige where he played her boyfriend. Swoon! P.S.S. He also has a foundation called the George Wilson SAFETY Foundation devoted to helping and educating adolescents. Next Would the Titans Draft Jamie Collins in the 1st Round?